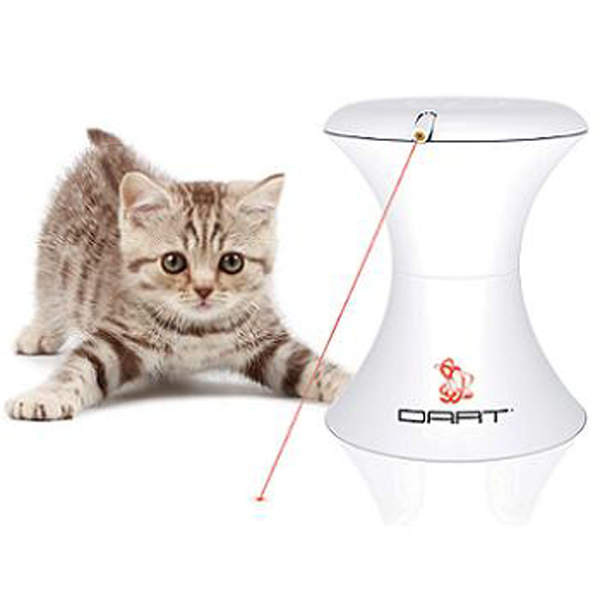 FroliCat Dart Interactive Cat Toy is an automatic rotating laser light that provides hours of fun for your feline and canine friends. Keep your pet's entertain while your away with this fun FroliCat Interactive Cat Toy the Dart! Variable speeds and timer settings offer 16 exciting play combinations. The Dart's automatic timer can be set for 10, 15 or 20 minute time periods but otherwise turns off automatically after 5 minutes. Dart offers four speeds that allow you to customize the speed settings for your pet (slow, medium, fast, or variable). Dart is an excellent way to encourage exercise for your dog or cat. *Requires 3 AA batteries, not included. Posted On 01/06/17 by Paula B from Canton, MI Yes, Paula B recommends this product! This toy has lots of variability to it - - speed of laser and how long it will run. That's great! My cat is a little scared of it right now, though she usually loves to play with a laser. I believe that she will enjoy it, though. My son said that he has seen her play with it.